Samsung Electronics announced Tuesday the tech titan will extend its official sponsorship for the Olympics until 2028, including the 2024 Paris and 2028 Los Angeles events, dispelling rumors about its possible withdrawal after the company’s involvement in a former president’s bribery scandal. Samsung said it signed the deal with the International Olympic Committee at Hotel Shilla in central Seoul, attended by its heir Lee Jae-yong and IOC President Thomas Bach, for a sponsorship amount publicly disclosed to cover up to the 2028 LA Olympics. With the latest contract, Samsung will become an official sponsorship member of the Olympics for 30 years. “Samsung will continue as the worldwide Olympic partner in the wireless communications equipment and computing equipment category, including the ability to promote artificial intelligence, virtual reality, augmented reality and 5G features of that equipment,” it said in an official statement. 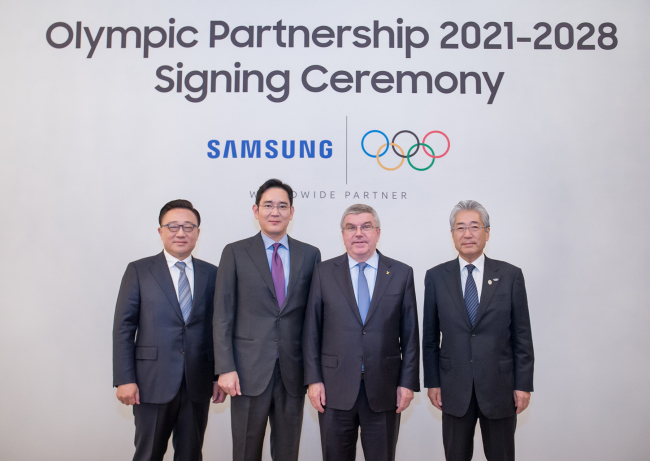 As part of the agreement, the IOC and Samsung will further develop their strategic digital collaboration to engage young generations around the world in order to promote the power of sports and the values of Olympism, it said. Samsung had reportedly considered opting out of Olympic sponsorship after a bribery scandal involving former President Park Geun-hye, which had included the Korea tech conglomerate’s financial influence related to a young horse rider with links to the ex-president. The political circle, meanwhile, had said that Samsung should be involved as a financial sponsor, citing ambitions for South and North Korea to host the Olympics in 2032. Samsung is the second-largest sponsor of Olympic events.